Under the restored Bourbons, Louis XVIII, 1814-24, and Charles X, 1824-30, the Empire style was continued. Some of the best work of this so-called Restauration style is in chair and table design. Chairs with gondola-shaped backs, rolled-over or concave backs, arms that scroll over and under to form armposts, and saber legs are typical. Lighter tables with either lyre or curving X-shaped supports are, as a rule, of pleasing design. The block-like forms of Empire commodes and similar pieces continued. 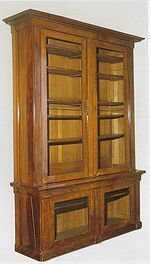 In addition to mahogany, light-colored woods, such as maple and lemon wood, were quite popular. Marquetry was no longer used. But inlay work in a contrasting color, such as amaranth inlaid on a light-colored wood or vice versa, which was employed to some extent under the Empire, became more and more fashionable under the Restauration, when it very often took the place of metal mounts. The majority of inlaid designs resemble a simplified version of Empire bronzes. The so-called Charles X style outlived the reign of that monarch, who was deposed in the July Revolution in Paris, to be succeeded by Louis Philippe, 1830-48, another member of the house of Bourbon. Much of the furniture belonging to this era is a potpourri of Empire, Gothic, Renaissance, and baroque Louis XIV, with a predilection for the marquetry of Boulle. About 1840 or earlier, the rococo Louis XV was revived, and it is with this style that the Louis Philippe pieces are closely associated. Louis Philippe is characterized by exaggerated cabriole legs, coarse carvings, and excessive decoration. 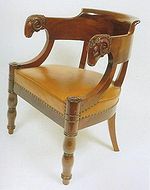 The furniture under the Second Empire, 1852-70, like all nineteenth-century cabinetwork coming after the style of the First Empire, displayed no unified style, but an interesting pattern of imitation drawn from the cult of past French traditional styles. The best of the furniture revealed fine craftsmanship, such as that by Fourdinois, who worked for Napoleon III and the elite of society. The Second Empire furniture is often extremely showy and ornate, but also characeterized by amazing variety and vitality. The desire for lavish display was apparent in the richly tufted and fringed upholstery with no trace of wood visible. Late in the nineteenth century a movement to emancipate furniture from the traditional styles of the past and to create a new style of design crystallized in Art Nouveau, a new “realistic” approach in the arts, seeking inspiration from nature.